Hard coatings are needed on plastic ophthalmic lenses to enhance both the mechanical durability of the relatively soft surface and the optical performance of lenses. Organic-inorganic hybrid can be used to generate functional coatings on a variety of substrates. Hybrid materials as molar ratio of 3-glycidoxypropyltrimethoxysilane (GPTS), methyltrimethoxysilane (MTMS) and tetraethyl orthosilicate (TEOS) were used to improve the surface characteristics and the optical properties on allyl diglycol carbonate lenses (ADC, or CR-39). This coating system has been applied to UV blocking coatings with UV absorbing materials on the lenses. In case of hybrid hard coatings and UV blocking coatings, pencil hardness was higher than uncoated lenses. Adhesion, hot water resistance and chemical resistance were good. The transmittance of UV light decreased with all absorber in UV blocking coatings. Spectacles are the principle means of correcting vision for three out of four wearers worldwide. The market for ophthalmic lenses is estimated at 800-850 million units a year. A corrective lens is made of plastic or glass. Since launch of the first plastic lens under the trade name ‘Ingard’ in 1936, the transition from glass to plastic has gradually gained speed, reaching nearly 100% in countries like the United States, the United Kingdom and Japan [1,2]. Plastic lens compared with glass have the major advantages such as low brittleness, low density, and easy usage and tinting. However, their softness makes wear resistant coatings absolutely essential in most cases . Generally, lacquer and vacuum deposition method are used for hard coatings of plastic lenses. Today lacquer hard coatings to protect plastic lens are predominantly based on sol-gel process . One of major advances of sol-gel is organic-inorganic hybrid coatings . This coating method is one of the most widely used techniques for the various functional coatings such as impact, toughness, and adhesion improvement. Besides, special additional such as mechanical properties improvement, UV (ultraviolet) blocking and photochromic behavior can be obtained [6, 7]. In this paper, the hybrid materials such as 3-glycidoxypropyltrimethoxysilane (GPTS), methyltrimethoxysilane (MTMS) and tetraethyl orthosilicate (TEOS) were used as precursors for preparing hard coating to improve the resistance of plastic lens surface. Hybrid coating compositions were also applied to UV blocking coatings on plastic lenses such as allyl diglycol carbonate lenses (ADC, or CR-39). The effects of ingredient compositions on the surface characteristics and the optical properties were investigated. 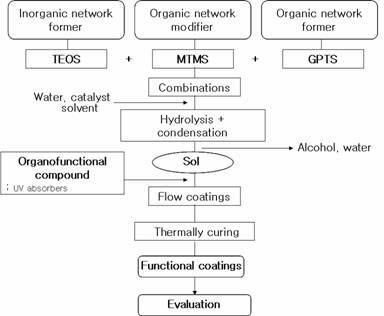 Coating solutions were prepared from tetraethyl orthosilicate (TEOS) as inorganic network former, 3-glycidoxypropyltrimethoxysilane (GPTS) as organic network former and methyltrimethoxysilane (MTMS) as organic network modifier. Hydrochloric acid (HCl, 37 wt.%) was used as a catalyst. Other chemicals such as ethanol, acetone and methyl ethyl ketone (MEK) were used as solvent and de-ionized water for hydrolysis. For preparation of UV blocking coatings, the UV absorbers such as 2-(2-Hydroxy-5-methyl phenyl)benzotriazole (UV P), 2-(2'-Hydroxy-5'-tert-octylphenyl)-benzotriazole (UV 329) and 2-Hydroxy-4-octoxy benzophenone (UV 531) were used. Allyl digylcol carbonate (ADC, or CR-39) were used as transparent plastic lenses. The transparent plastic lenses were used after washing with ethanol and dried at 50℃ before coating. The preparation of the coating solutions and processing is shown in Fig.1. In our case, the studied molar ratios of GPTS:MTMS:TEOS were 1:1:1, 2:1:1, 1:2:1 and 1:1:2, respectively. Molar ratio of silica precursors:ethanol:H2O:HCl was fixed at 1:4:4:0.03. UV absorbers for functional property were dissolved in the sol at room temperature. Using these solutions, flow-coating was performed on the front surface of plastic lenses. After coating, the samples were dried at 80°C for 30 min. and thermally treated at 140°C for 4h. Fig. 1. Schematic overview of functional coatings. Transmittance was measured with an UV-Visible spectrophotometer (Shimadzu corporation, UV-1650PC). The sol-gel coatings were characterized using scanning electron microscopy (SEM) (Hitachi, Ltd., S-4100). The mechanical property tests chosen for functional coating lenses were as follows. The adhesion test was determined by means of ASTM D3359 (cross-cut and tape test). For assessment of hardness, pencil hardness test according to ASTM D3363 was performed . Abrasion test was done by means of steel wool abrasion test. Hot water resistance was investigated by immersing in boiling water for 15 minutes. Chemical resistance was assessed by rubbing with acetone or ethanol against lens surface. Inorganic coatings are known for their high resistance to heat and damage, but they are very brittle. Organic coatings are flexible, good adhesion to substrates and can easily be modified or functionalized but don’t have a high damage or heat resistance. Organic-inorganic hybrid materials can be used to generate new functional coatings on plastic ophthalmic lenses. We chose to design the hybrids based on the type of interactions between the organic and inorganic network former and organic network modifier. The influences of chemical composition on the mechanical properties of organic-inorganic hybrid with different coating formulations were studied. The preparation of the coating solutions started with hydrolysis of silica precursors in aqueous HCl solution as the catalyst. The solutions were stirred for 16h. The prepared coating solutions were allowed to flow down the prepared plastic ophthalmic lenses (CR-39) from the upper edge so that the coating solutions were spread over the entire surface of the lenses. The coated lenses were pre-cured at 80°C for 30min and then cured at 140°C for another 4h. After curing, the coating layer appeared to be transparent. The formulations and curing conditions of the samples studied in this work are shown in Table 1. The comparisons of mechanical and optical properties of hard coating lenses are summarized in Table 2. Fig. 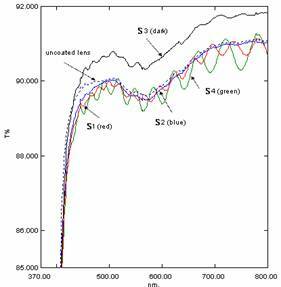 2 shows the optical transmittance spectra of the coatings with different silica precursors molar ratio. It can be seen that the transmittance of the coating is similar when sample code is S1 and S2. S4 has lower transmittance than uncoated lens, but S3 has relatively higher than uncoated lens. The difference of transmittance between S3 and S4 is 0.88% and there is not a great difference between the two samples. At each surface, light is lost partly by reflection. Anti-reflection coatings are possible because light travels as a wave and makes use of what is called the destructive interference technique . Therefore if anti-reflection coatings is applied to hard coated lenses, the transmittance of all samples will increases. The surface appearance of hybrid coatings was studied by SEM. The sample code S4 has a smooth appearance, as shown in Fig. 3. Cracks and specks were observed in other samples. Fig. 2. Optical transmittance of the coatings on plastic ophthalmic lens. The cross-cut and tape test method was used to characterize the adhesion between the coating layer and the substrates. In this test method, quality rating of the adhesion was determined from fractional area of the lattice in which a part or the whole coating layer was removed from the substrates. Five quality ratings are assigned: 5B for 0% removal, 4B for less than 5% removal, 3B for 5 to 15% removal, 2B for 15 to 35% removal, 1B for 35 to 65% removal, and 0B for more than 65% removal, respectively . As a results shown in Table 2, all of coating layer exhibited 5B quality rating. These organic-inorganic hybrid coatings have a very high hardness of 5H when determined by a pencil test but uncoated lenses have a hardness of 3H. The steel wool abrasion test was used to characterize the scratch resistance of the coated lenses. The lenses were rubbed with #0000 steel wool in a back-and-forth motion under a load of 400g. The surface was then examined by the naked eye. According to this test, the scratch resistance improved appreciably for the sample code S4 containing the ratio of 2 molar TEOS to other silica precursor and improved moderately. Apparently, uncoated lenses, S1 and S2 exhibited more than 3 scratched lines. The coated lenses were dipped in boiling water for 15 min. The condition of the coating was examined by the cross-cut and tape test and the naked eye. The chemical resistance tests were performed by the method that a cotton saturated swab was soaked in solvent and rubbed over the surface of the coatings. The lenses passed hot water resistance and chemical resistance using acetone and ethanol. No visible defects were detected. The optimum properties were obtained when the ratio of GPTS:MTMS:TEOS was 1:1:2. There is no doubt that UV exposure has some detrimental effects on the eye. Its effects are seen in acute photokeratitis and it is thought to contribute to cataract and age-related macular degeneration. A variety of means exist to protect eyes against UV, in the form of spectacles, goggles, shields, or helmets. The protection can be realized by embedding of UV absorbers or by coating with UV absorbing materials. In this part, we deal with UV blocking coatings by combination of organic-inorganic hybrid materials and UV absorbers on plastic ophthalmic lenses (CR-39) to minimize the UV exposition with a remaining high transmission of visible light. The coating solutions and conditions were used as the same above, i.e. sample code S4 (molar ratio, GPTS:MTMS:TEOS = 1:1:2 ). After the UV absorbers were completely dissolved in MEK, this solutions and coating solutions were mixed together until homogeneous. Using these solutions, flow-coating was performed on plastic ophthalmic lenses (CR-39). Fig. 4. UV-Visible spectra in ethanolic solution (0.003 wt. % , Absorbers : UV P, UV 329, UV 531). Fig. 5. UV-Visible spectra of absorbers, UV P, UV 329, UV 531 coatings on CR-39 lenses. 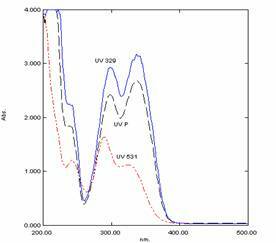 The optical properties of the UV absorbers were investigated in solution, and the transmittance and UV blocking of these coatings were measured with an UV-Visible spectrophotometer. The absorption spectra of the UV absorbers are shown in Fig. 4. UV 329 and UV P show a similar absorption spectrum from ca. 260nm to ca. 400nm. UV 531 exhibits two main peaks at 289nm and 324nm. An absorber UV 329 contains a maximum absorption at higher wavelengths compared to absorber UV P and UV 531. UV 531 has an absorption minimum at lower wavelengths. The results of UV blocking coatings are shown in Fig. 5 and Table 3. The transmission of UV light in these coatings decreased with all absorbers, the decrease was especially pronounced in the UV-A range. Also the transmission of visible light was reduced in the order of UV 531, UV 329, and UV P. For UV blocking coating containing UV P, the transmission of visible region (380-780nm) was very low, and the reason is that UV P coated lenses exhibit a yellowish hue and poor optical clarity. Other tests were evaluated as the same Table 2. All coatings were evaluated on adhesion, hardness, abrasion, hot water resistance, chemical resistance, and appearance. The results are shown in Table 4. All coatings showed good adhesion on CR-39 lenses as well as hot water and chemical resistance. The pencil hardness was higher than uncoated lens, but was lower than a hard coated lens without UV absorber. The hard coating which had the UV absorber exhibited a poor abrasion. UV 329 and UV 531 protective coatings showed some cracks, whereas UV P coated lens showed opacity. Organic-inorganic hybrid hard coatings for improving the surface characteristics and the optical properties on plastic ophthalmic lenses such as allyl diglycol carbonate lenses (ADC, or CR-39) had been successfully developed by sol-gel processing when the ratio of GPTS:MTMS:TEOS was 1:1:2. 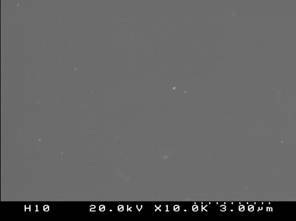 In this coating, the optical transmittance was 86.76%. Adhesion had a good as 5B. The coated lens had higher hardness of 5H than uncoated lens of 3H hardness and the scratch resistance improved appreciably. Also hot water resistance and chemical resistance had stable. Their surfaces were essentially crack-free. The results of organic-inorganic hybrid hard coatings have been applied to UV blocking coatings with UV absorbing materials on CR-39 lenses. In case of all UV absorbers, the transmission of UV light and visible light decreased, the decrease was dramatically in the UV-A (315-380nm). Especially, for UV P coated lens, the transmittance was very low in visible area. Adhesion, hot water resistance and chemical resistance of the UV-coated CR-39 lenses were good. Pencil hardness was 4H, but abrasion was poor. 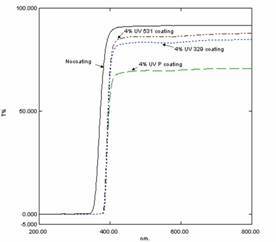 From the results, the organic–inorganic hybrid coatings containing UV absorbers could be satisfactorily used as UV blocking coatings, due to the decreased transmission in the UV range. This work was supported by grant from New University for Regional Innovation (NURI, 04-A-C-25). 3. F. Samson, “Ophthalmic lens coating”, Surface and Coatings Technology, 81, 79-86(1996). 4. J. Martínez Urreaga, M.C. Matías, V. Lorenzo, M.U. de la Orden, “Abrasion resistance in the Tumble test of sol-gel hybrid coatings for ophthalmic plastic lenses”, Materials Letters, 45, 293-297 (2000). 5. Wenxiu Que, Z. Sun, Y. Zhou, Y.L. Lam, S.D. Cheng, Y.C. Chan, C.H. Kam, “Preparation of hard optical coatings based on an oranic/inorganic composite by sol-gel method”, Material Letters, 42, 326-330 (2000). 6. K.-H. Haas, S. Amberg-Schwab, K. Rose, G. Schottner, “Functionalized coatings based on inorganic-organic polymers (ORMOCER®s) and their combination with vapor deposited inorganic thin films”, Surface and Coatings Technology, 111, 72-79(1999). 10. ASTM D 3359-02, “Standard Test Methods for Measuring Adhesion by Tape Test”, ASTM International.